The posting of a bond may also be avoided if there is an executor (as in a Will) rather than an administrator (as in intestacy). Generally, the Surrogates Court requires that a fiduciary managing the estate post a bond. This requires that the fiduciary’s personal credit be run by the bonding company and is another expense of the estate. If the fiduciary does not have good credit, he cannot serve as fiduciary. However, a Will can state that the posting of a bond by the executor is not required. Also, those with children under eighteen years of age should have a Will in order to appoint a guardian for their children. Otherwise, the Court would appoint someone to care for the children. Obviously, most parents would rather select their preferred guardian for their children. Once the parents agree as to who should serve as guardian and the guardian agrees to serve, it is appropriate to have the Will drafted. It is important in New York to have estate documents drafted by a skilled professional, who will make sure that they are signed in accordance with statutory requirements. Should a Will be improperly executed, it is not valid and the rules of intestacy will dictate the distribution of the subject estate. 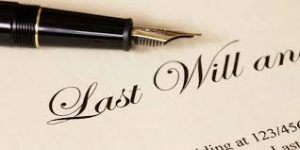 Engaging in the process of having a Will drafted is also an opportunity to check on other aspects of estate planning. Perhaps one of the multiple types of trusts is appropriate for the client, whether included within the Will or as its own separate document. In addition, your attorney may recommend that a Living Will or Health Care Proxy be drafted to state the end of life care wishes of the client. Likewise, checking beneficiary designations and the manner in which title is held is required, since the Will would be effective only on those assets that are not jointly held with another. Also, certain assets such as life insurance, retirement accounts and pension plans are distributed according to beneficiary designations, rather than as stated in the Will. Reviewing these issues with your attorney may result in the revision of beneficiary designations and in title transfers. We look forward to listening to the specific situations and concerns presented by our clients as we draft all necessary estate documents.